Upon realizing you have a water leak, your first line of defense is your eyes. You have to be observant. That means getting a flashlight and crawling under the sink to investigate exactly what's going on. You want to determine where the leak is coming from. Is it coming from the connecting joint between the end of the water line and the faucet? Or is the water leaking out of the side of the pipe? Each type of water leak has its own remedy. Lying on your back under the sink, place the jaws of an adjustable wrench around the connecting nut where the water line connects to the bottom of the faucet. Screw the wrench closed around the nut and incrementally turn the wrench clockwise. Don't turn too hard or too much at one time. Make a small adjustment each time. Wipe the nut dry and wait to see if the water stops leaking. Repeat step 2 again to see if the water stops leaking. Find the water valve for the leaky pipe under the sink and turn off the water. If it's the cold water line, turn on the cold water faucet at the sink to confirm the water is properly turned off. Take an adjustable pipe wrench and loosen the connecting nut between the end of the water pipe and the bottom of the faucet until the two are separated. Wrap Teflon plumber's tape--a thin white tape used to stop water from leaking--through the threaded pipe connection, then clockwise around the pipe two or three times. Reattach the water line to the bottom of the faucet. Turn the nut until it is tight and then turn the wrench just a little more beyond tight. This ensures that the Teflon tape is compressed tightly in the threads, which will keep the water from oozing out. Turn the water valve back on. Check to see if the water stopped leaking. Turn the water valve off on the water line. Saw out the section of leaky plastic PVC pipe. Saw a new section of PVC pipe and cement a PVC coupler to each end before cementing the patch back into the existing water line. A coupler is a small PVC joint that allows two sections of PVC pipe to be permanently connected to each other. Wait a half hour to let the cemented connections cure before turning the water valve back on. Check for leaks. Find the leak in the pipe and stick the tip of a toothpick in it. Wait for the toothpick to swell from absorbing the water which will stop the leak. Break off the excess toothpick. Mix up a two part-epoxy and apply it over and around the toothpick. Wrap gauze around the pipe where the epoxy sits over the toothpick. Apply more epoxy over the gauze at the point of the toothpick. 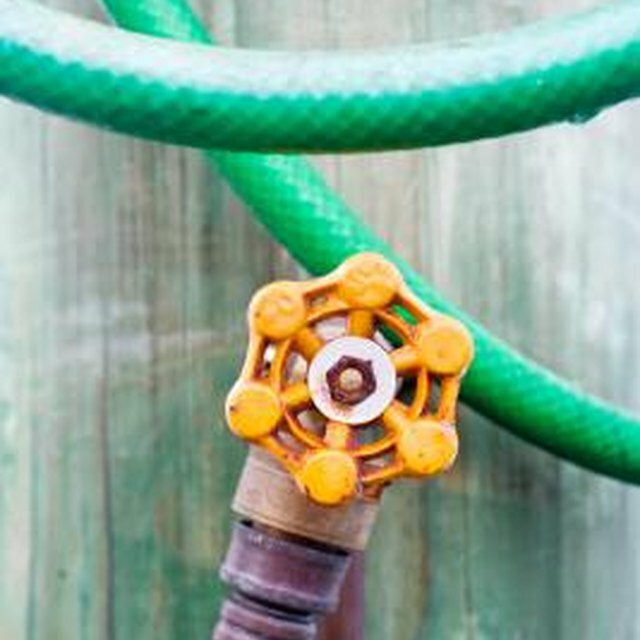 If there is no turn-off valve on the water lines under the sink, find the main water valve to the house and turn off all the water coming into the house. The main water valve is where the water pipe enters the house. PVC pipe glue is toxic smelling. Make sure you work with it in a well-ventilated area. After cleaning the PVC pipe with solvent and applying the cement, a chemical reaction ensues between the cement and the PVC pipe. You have seconds to push the two PVC pipes together via the PVC coupler. It's important to be organized so you can work fast. B. Ellen von Oostenburg became a full-time writer a decade ago. She has written features for local and state newspapers, as well as magazines, including Milwaukee Magazine, Wisconsin Trails and German Magazine. A graduate of the University of Wisconsin - Madison, von Oostenburg holds a Bachelor of Science Degree in fine art.